Denmark booked its ticket to Russia in style in the second leg in Dublin, running away with a tie that was in the balance after a goalless first game in Copenhagen. 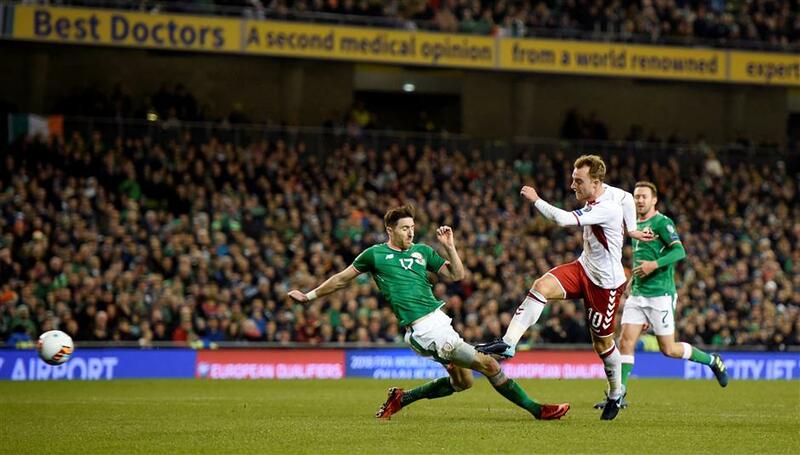 Denmark midfielder Christian Eriksen scores the fourth goal to complete his hat-trick against the Republic of Ireland during their 2018 World Cup playoff second leg in Dublin on November 15, 2017. The Danes won 5-1 to qualify for Russia. Denmark goes to next year's World Cup with one of the world's top 10 players in Christian Eriksen, coach Age Hareide said on Tuesday, after the Tottenham Hotspur playmaker grabbed a hat-trick in the 5-1 thrashing of Ireland. "All the teams who go to the World Cup have star players and players who can make the difference and Christian showed that today," Hareide told a news conference. "He's absolutely in the top 10 (players in the world). We saw it against Real Madrid, he's probably one of the best players in his position in Europe at the moment. "He has this capability of scoring goals, making assists and finding space." Asked how far his free-flowing team could go at next year's tournament, Hareide said it would depend on the draw but added that the side wanted to improve and play good football. For Ireland, it was a very different story. Solid and organized four days ago, and leading early on Tuesday, the hosts completely capitulated, leaving manager Martin O'Neill to face difficult questions over his tactics, halftime changes and whether the occasion got to his players. "I'm naturally disappointed because a couple of nights ago in Copenhagen we had fought very, very strongly," O'Neill, who cut short an interview with national broadcaster RTE, told a news conference. "The two goals we conceded in the space of a couple minutes (to trail 1-2) knocked us for six really, they were very, very poor goals ... We were well beaten in the end by a side who are technically better than us." O'Neill said he still intended to sign a new two-year contract agreed in principle with the Football Association of Ireland and would guide the team in its bid to reach Euro 2020. With questions over O'Neill's tactics likely to dominate the Irish sports pages on Wednesday, his opposite number was asked how successful the Irish manager's approach had been. "If you lose 5-1, you're not successful," Hareide said. Eriksen said his performance on Tuesday would be life-changing. The midfield maestro, who had missed a couple of decent chances in the goalless playoff first leg, made no mistake in the Dublin return as his treble put the Irish to the sword. "It's incredible to take your country to the World Cup with three goals in a playoff," said 25-year-old Eriksen. "It's going to mean a lot throughout my career, throughout my whole life, really. It's a big thing and I'm very happy about it." The Danes also benefited from an Andreas Christensen goal, that cancelled out Shane Duffy's early header for Ireland, and a late Nicklas Bendtner penalty but Eriksen stole the show. "We cannot ignore that Eriksen delivered an incredible performance and probably played his best international game, in my opinion," Bendtner told reporters. Despite the plaudits of his teammates and his central role in the victory, Eriksen was his usual humble self. "It's a crazy feeling, we've been fighting together for so long since the qualification started," he said. The Danes did not panic when Duffy scored and a short corner saw Pione Sisto beat Harry Arter before flashing the ball across the box where Christensen's shot was deflected into the net by Ireland's Cyrus Christie just before the half-hour mark. "After scoring one goal it was a big knock for Ireland, we got a lot of confidence and started to play good football," said Eriksen. He added Denmark's second soon after and put the game out of Ireland's reach just past the hour before completing his treble. Eriksen, who has scored 21 times in 75 internationals, said there were more goals to come from Denmark in Russia. "We'll take this with us and try to score as many goals as possible at the World Cup as well," said the midfielder, who doused former international defender Lars Jacobsen, who was broadcasting for Danish TV, with champagne as he celebrated.